Hey lovelies. I feel as though over the last few years of trying to grow out my hair I have trialed my fair share of hair care. So today I thought I would narrow it all down to my top 5 must haves for hair care. Number 1: Aussie 3 Minuet Miracle- Winter Remedy. This hair mask really does restore all shine back into my hair and feels so much stronger after I've used it. although I wouldn't recommend using it every wash or too often in the week as I find it starts to way down my hair. So once every other week is good. Number 2: Lee Stafford Bleach Blondes Shampoo and Conditioner ( I don't have a condition at the moment i'm all out unfortunately) But i find its the shampoo I find is the most effective any way. This Shampoo is actually amazing if you have blonde hair. (i'm aware that at the moment my hair is a little darker so I haven't used in a while but its still in my top 5) Being blonde can sometimes mean your hair can look a little on the yellow side especially if you've coloured you're hair like me. When I'm blonde I wash my hair with this every other wash unless I want lilac hair which some times I do. It smells incredible and yes it is as purple as it looks. It baffles me how few people have actually hear of this shampoo. I tried a fair few purple shampoos before I found this beauty. Any time see someone asking for help when searching for a purple shampoo I jump in a recommend this one without fail! Number 3: Batiste Dry Shampoo no scent in particular but at the moment I am using Tropical. While growing out my hair a few years ago I kept reading DO NOT wash your hair every day, and it took a while to really see why. And now i'm telling you not too. Your hair needs all its own natural oils to really repair its self. I found by using dry shampoo in between washes helped to keep my hair looking fresh. I go about 3-4 days without washing my hair sometimes 5-6 days depends on where my days off are and if I have anything planned. May sound gross but I do believe its helped my hair a great deal. Number 4: OGX Argon Oil of Morocco, holy crap this stuff... I have no words other than Game Changer!! I apply a pea sized amount onto damp hair every single time I wash my hair without fail. One time my boyfriend and I went away for a weekend and washed my hair but I forgot my oil ... my hair got so so tangley (yes i'm aware that's not a really word) and matted and wasn't its normal silky smooth self.. I wanted to cry... never again will I leave home without it. It keeps my hair from getting tangled, from splitting and if and when I curl my hair I apply a little through the ends of my hair it really helps to define the curls and make them shinier and more bouncy. Number 5: Alberto Balsam conditioner in the scent coconut and lychee, this is something I have rediscovered recently. Back when my mum was buying my shampoo and condition for me I use to use this all time all the scents smell divine, like literally good enough to eat. I have been using this conditioner every single time I wash my hair for around a month. When I first purchased and discovered the consistency is a little watery I had started to think that it wasn't going to work as I had only been using thicker and creamier conditioners, but I was pleasantly surprised and will defiantly be repurchasing it along with the shampoo this time to see if that is just as good. It leaves my hair feeling really light weight and silky, this conditioner doesn't get any where enough credit and for £1 you can't really go too wrong. In comparison to my normal TRESemme £4-5 per bottle its not that bad! 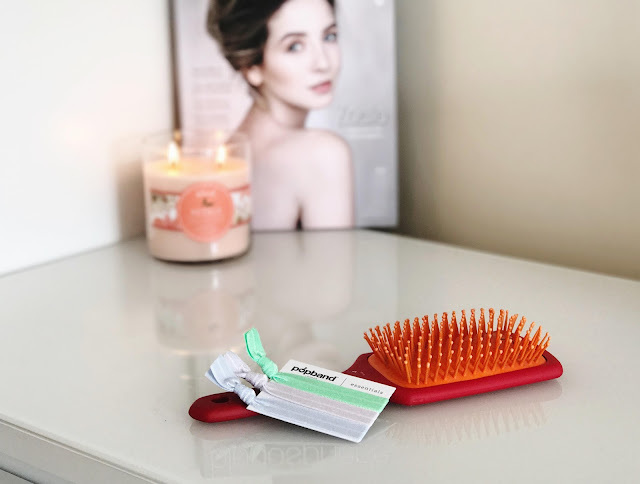 Bonus: Really looking to look after your hair... Get your self a paddle brush, wide tooth comb and some of these pop band hair ties (or any other brand in this style) they do not damage your hair and for the love of god only brush your hair wet if have to and and use the paddle brush or wide tooth comb!! Your hair is most delicate when its wet. My friend starts at the roots when brushing her hair wet/dry... It makes cringe and I tell her every single time work your way from the bottom getting rid of knots as you go. Tip: Coconut Oil is your best friend and a totally inexpensive hair mask! trust me! Also wearing your hair in protective hair styles such as up in a bun or in a plait can protect it from the environment especially when it's windy. I did this for a month and noticed a huge difference in the growth of my hair. Thanks for reading, if you have any other tips for me I'd love to hear them! !